According to this report from the Tehran Times, we’ve had yet another statement from the Iranian President in support of Palestine! It seems that the man is trying to position himself as a bridge-builder between Shiite and Sunni Muslims through his open support of Hamas. It would be interesting to know exactly what transpired between Ahmadinejad and Marzook on the subject of Syria. Syria is Iran’s main ally in the region and does not want to see the current regime overthrown. Hamas, on the other hand, have been channeling military personnel into Syria to help topple the Assad government! Even so, however we understand Syria’s place in the equation, the basic picture for Israel is clear. Muslim countries are uniting more openly around Palestine and Israel is experiencing ever-greater international isolation. And already their last remaining ally – the USA – is starting to waver! TEHRAN – Iranian President Mahmoud Ahmadinejad has said that the liberation of Al-Quds (Jerusalem) has become a common goal of all Muslims and freedom-loving nations. He made the remark during a meeting with Mousa Mohammed Abu Marzook, a senior member of Hamas, in Tehran on Monday. 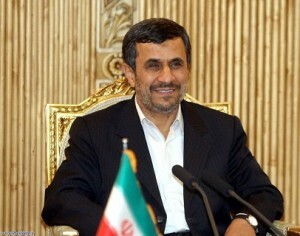 A glance at Zionists’ decades-long presence in the region proves that they are in a state of collapse, Ahmadinejad noted. He added that the Palestinian question is a crucial issue for the whole world, and its liberation is tied with the destiny of the entire region. The president also reiterated Tehran’s support for the oppressed people of Palestine until they achieve victory. Commenting on the Syrian crisis, Ahmadinejad noted that it is a high time that all sides in Syria make efforts to settle the conflict through dialogue. For his part, Marzook said Palestinians can achieve victory over the Zionists only through resistance, emphasizing the need to promote unity between the Islamic Ummah. The Palestinian official also called for making efforts to resolve the Syrian crisis through mutual understanding. Tags: Hamas, Iran, iranian president mahmoud ahmadinejad, israel, palestine, regime change in iran, syria. Filed under Israel and Palestine by Father Dave on Mar 8th, 2013.